Cook anything, anytime, anywhere, regardless of the situation. 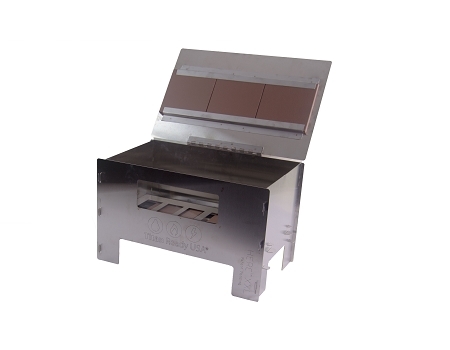 Bake, cook and dehydrate without the use of electricity or gas, indoors or out. 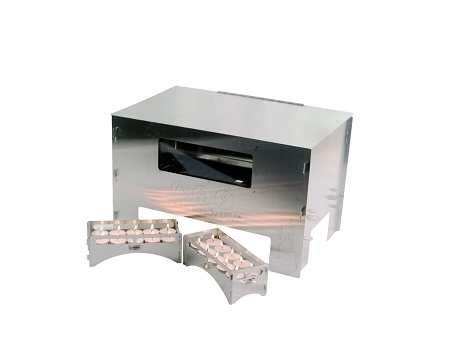 The HERC™ XXL (Home Emergency Radiant Cooking) Oven is designed to harness the thermal energy from tea light candles storing it in quarry stones. The patent pending design of the HERC XXL uses not one but two methods of thermal energy transfer. Like your conventional oven, HERC XXL uses convection and electromagnetic radiation (radiant) like the sun heats you when you step outside. 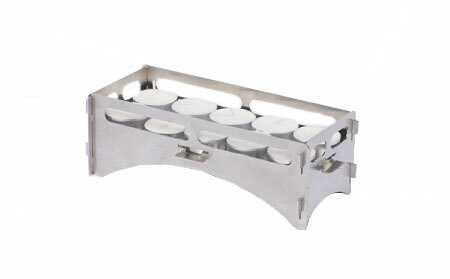 Fueled by tea light candles makes baking & cooking without the use of electricity or gas easy, economical, and even fun! The HERC XXL Oven provides an alternative cooking method for your family in the events of limited resources and/or emergency situations. When I received the HERC oven, I was so excited to try it. I practiced heating it on two occasions before I decided to try cooking food in it. Could get it to about 300 degrees each time. I baked a lemon cake in it and it turned out perfectly baked. It browned well on the bottom and sides but did not brown on the top... no problem because I cover the top with frosting anyway! It took about an hour to bake the cake which is probably twice as long as it would take in an traditional oven, but I LOVE being able to cook off-grid. Have already recommended this oven to several friends who also would like to cook off grid. Found it to be solidly built and easy to assemble. Can't wait to cook in it again.... and often! I heard great things about this oven so I was excited to try it out.It took only about a week to arrive after I placed my order. The assembly instructions were simple to understand and the assembly went quickly and without problems. I have only cooked in it once since I have only had it a week, but I preheated the oven for 25 minutes and placed a piece of salmon, some frozen spinach and some water to heat for instant potatoes in 3 small containers all at once and all were cooked and heated within 30 minutes of time in the oven. I was very impressed. I tried one of the metal plates to smother the candles just to try it out. It did it's job quickly and efficiently. I then lifted the plate out and most of the candle wicks stuck to the plate because it was cold and since the wax was melted they lifted out easily. I think if I were to use the plate again I would wait until the candles had solidified and then carefully remove the top plate. No big deal just a learning tip. I like how compact it is when broken down and it fits nicely into the bag that it comes with. I have tried several different alternative ways of cooking but most need to be done outdoors. It's nice to have a cooking alternative that you can use in the house and very cheap to run. I figure I can use one set of candles 2 or 3 times depending on what I am cooking. I would highly recommend this oven. Well worth the wait. Very easy to assemble and use. This fills a hole in my preps for power outages and the food tasted great! My oven arrived very quickly and when the UPS guy handed over the box, I was really surprised at how HEAVY it was! Once I got it open I could see why - the oven is built of very heavy-duty steel. I was impressed by what I saw, and set to putting it together. All went pretty smoothly except trying to fit the tile holder together - a quick phone call to Kris (the owner) and I had an answer, just needed to make a slight adjustment to the bend of the top piece to get it to fit onto the bottom piece. Kris suggested that I do that but that he would be very happy to send out a new piece if I had further trouble with it. Each piece of steel was covered in a film to keep it from scratching, so peeling all that off was fun! :) I have not yet cooked in the oven (too much going on to try it out) but have no doubt, based on the YouTube videos I have watched, that it will meet my expectations. Having something that can be used to cook INDOORS in my arsenal is exactly what I wanted. I broke the oven back down which was as easy as putting it together, slid it into the included heavy canvas storage bag, and can't wait to give it a real cooking trial ASAP. I highly recommend this item. Being in earthquake country here, you never know when you might need it! When I got my HERC oven I wanted to really put it to the test! Left it out for a couple of months and everytime I had something to bake in my regular gas oven I also baked a portion in my HERC oven! Casseroles, potatoes, cupcakes, cookies, cereals, stratas, chicken, roasts and more! Dehydrated items like jerky, soaked and dried nuts, fruit leather etc I did at half candle power! Something I would need to do in a true emergency situation when my electric dehydrators would be powerless. I even baked two small Cheesecakes for my son's birthday just so we could see how the HERC handled it. We actually think the HERC did a slightly better job and the cheese cake was ever so, perhaps, a tiny bit moister! I had to adjust baking times for some things but usually less than 30 minutes and that's pretty darn good for a few candles that just cost me a few pennies and all in the comfort of my kitchen! Through our rainy cold winters in Oregon, that perk was totally a huge plus!! Found the oven all that I was told it would be. Have tried cooking once and am still trying to learn how to cook it cook with it. Overall I am really pleased with the oven and can't wait to master cooking in it. I bought this oven because you can cook in the comfort and safety of your home in an emergency and the source of fuel is much cheaper than other emergency fuels (like propane or charcoal) and easy to store. 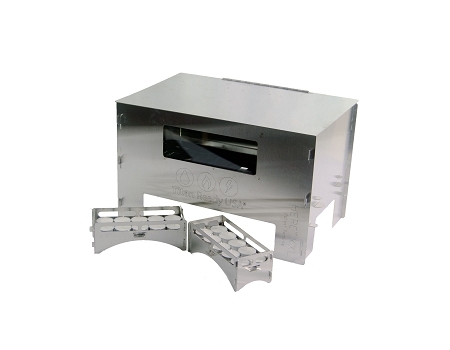 It is heavy duty and made of high quality materials. Mine came without an instruction book, but we still figured out how to put it together based on the picture online and some common sense. We did need 2 people to put it together - maybe there is a trick for one person doing it. We have only tried baking cookies so far. It takes longer to cook but it works. Tip: use a mix of baking soda and oil to get any sticker goo off when you first unwrap it. Tip #2: Get the ove' glove or something like it to help get pans in and out of the oven easier. Also, this is made in the USA! I picked mine up from their shop and was very impressed by this small business. The HERC XXL Oven deserves every bit of praise that it gets. It is excellent quality, and the design and functioning of the oven has really been thought through. We baked cookies first, and they were better than the ones in our normal oven, softer and not as dry, but still fully cooked - very soft and delicious. It made me realize that cookies get dried out a lot when cooking in a regular oven- but not with the HERC XXL Oven. They were just right. So then I tried something a little more challenging; I made my wife's birthday cake, which was a chocolate cake in a bundt cake mold in the HERC XXL oven. It turned out amazing. It was one of the most evenly cooked, moist cakes I've ever had. I don't know why but 'natural heat' seems to make a big positive difference in cooking, things that absorb heat from flames or ceramic/radiant heat. And this is nowhere on display better than with the HERC XXL oven. Given the small candle flames, it cooks evenly and the terra cotta stones then distribute the heat very evenly and gently, providing a consistent temperature throughout the oven and over the cooking time. I look for opportunities to cook in the HERC Oven, over our normal oven, simply because it does such a good job. I was very excited to receive my new oven. This weekend I took it out for a test run. I decided to bake something easy and chose a cake. Normally it takes about 35 mins in my home oven and in my HERC it took about an hour longer. The cake was almost overdone! I had cut two of the wicks to short and then drowned in the wax and it still baked the cake. I purchased tea lights from IKEA and they worked just fine. Living in the northwest having an indoor emergency cooking solution is fantastic. I am so happy I purchased! Customer service is the best I have ever experienced. I spoke with Chris a few times and I was really impressed with him and his commitment to complete satisfaction. In the course of our conversations, Chris asked me to assemble the oven myself, which I finally did just this evening. The three most dreaded words to me are "some assembly required." I just am really incompetent putting anything together and following directions and picture instructions. Anyway, it took me about 22 minutes to put the oven together. The next time I do it, it will probably take me about five minutes less. I'm just not very good at assembling things. I have used this oven several times to bake casseroles, cookies, and bread. I purchased this size because I have five children and wanted to be able to make enough dinner for all of us as well as be able to bake three loaves of bread at once. Like I have seen noted in other reviews, it takes longer to bake foods in this oven. I think it's really important to get an oven thermometer for the oven as well as a food thermometer to check internal temperatures of what you are baking. The casseroles and cookies baked just fine, they just took longer. The bread also took longer and turned out just fine, but it didn't ever get a nice golden brown crust on top. One problem I had with the oven that I didn't see addressed anywhere in the instructions is that you can't (at least I couldn't) lift the lid with one hand and put your dish in the oven with the other. I had my oven come apart twice doing that. It was a little stressful. I have several ways of baking in an emergency--Dutch ovens, trailer oven, propane camping oven, Global sun oven, and now the HERC oven. Dutch ovens and the propane trailer oven and camping ovens are great, but here if we have an emergency, usually the weather is also bad and I don't want to be going outside. And for us, bad weather also often involves wind, which makes using Dutch ovens and charcoal briquettes difficult. I really like my sun oven, but unfortunately, even though I live in a desert with mostly sunny days, I cannot use it very often because in even a light breeze the reflective sides will blow down. And the sun oven doesn't work when the sun is down. The HERC works no matter the weather or the time of day, and it works inside so I don't have to go out into the elements. And while the HERC weighs more than the sun oven, it doesn't take up near as much space when being stored. HERC Ovens are 18 gauge brushed #304 stainless steel, laser cut so every oven is guaranteed to fit without fail. For less than the price of a Sun oven and stores away in 1/20th the space, you are not outside waiting on the sun, hoping those clouds don't come this way. 389 points will be rewarded to you when you buy this item.